We’ve reached a day when every business applications are built with a varieties of complexity and grows with large volume of data. Over the time when data volume grows or user base increase , there is a scope of decreasing the overall performance of the application or even failed to deliver as expected. For this reason as a precaution actual capability of the application must be measured in advance to avoid unexpected situations. Now a days simple application which will serve single user consistently is becoming antique. This is time when applications scalability and performance plays a vital role in the software specification as well as architecture. 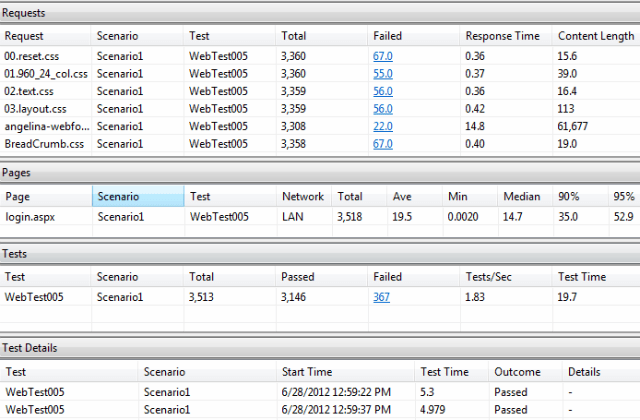 And thus the performance testing and analysis became handy. Goal of this article to provide a quick and simple approach to configure load test for real scenario and analyze results. 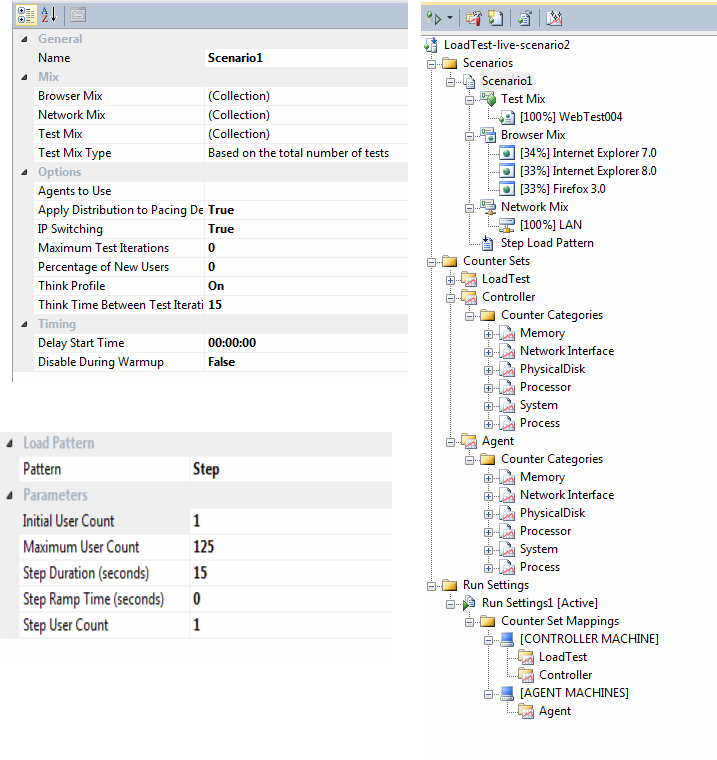 Through this article I will share my experience of implementing load testing and analyzing results with visual studio 2010 ultimate. “load testing with visual studio 2010” goggling this phrase is more then enough for anyone to find lots of fantastic articles about basic load testing setup. 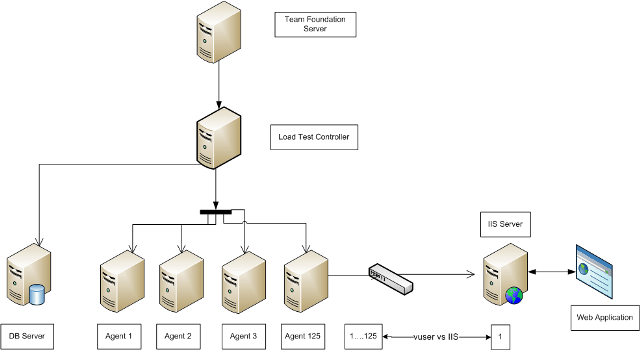 So in this article we will not walk in that path, instead I will share some additional info and share some configurations that will require to setup load testing for real life and focus on the analyzing the results. But before moving on I recommend you to learn basics of web test and load test if you are completely new to this kingdom. Visual studio 2010 shipped with very handy testing tool, we are going to utilize this tool to perform load testing. I recommend you to go through how to setup web test first, it will help you understand better.You can suggest any additional info to make this post more helpful. It is recommended that performance testing database and application database shouldn’t on the same server otherwise while test controllers sample and save the load test run results in the database on the application server it may impact the test results. Another consideration is database.Visual Studio strictly requires SQL Server for the load test store. If you don’t have a SQL Server database, you cannot save test run data. You can check the databse setting from Test (visual studio menu) > Manage Test Controllers. A dialog will appear which allows set/reset of connection string of test data store. Load test analyzer graphs display counters. Each graph follow a specific measurement to plot a graph. The y-axis is not labeled with any specific range, but is instead labeled with values from 0-100 that represent a percentage of the total range for each counter. For example, for a counter with a range of 1000, a data point of 60 on the y-axis would correspond to a value of 600 for the counter. The horizontal timeline x-axis for a collapsing graph has an origin of 00:00 and a range that covers the entire test run. Average’s are not plotted in graph. We can create an HTTP summary graph which will contain “Request time out”,”Passed request”,”Failed Requests”. This will provide time-based frequency of errors over the duration of the test. Error rate is an important metric in stress testing. This indicates the maximum number of users that can be served correctly, without errors and hence application capacity. Visual studio load testing has a builtin graph called “Page Response Time”. This response Time versus Elapsed Time report indicates the average response time of the transactions over the elapsed time of the load test as shown. Same “Page Response Time” graph can be utilize for this purpose. This graph represents average response time for the each page in time. Each bar in the graph is the average server response time for each page.From this graph it possible to identify slowest page of the application. Same “Page Response Time” graph can be utilize for this purpose too.Each point in the graph is the average of the page download time during that interval. Page Download time graph of individual pages help you to identify the exact page that has high download time. Built in”Test Response Time” graph can be used for this purpose. If we analyze Response Time Vs Test response Graph we can find out the capability of the web application.The Response Time graph shows the time the server took for responding as the test load is increased. The peak indicates that the server has reached its capacity to serve data, and is unable to scale further. Microsoft continues to make in-roads into open source development. Early last year it open sourced several development related tools, including NuGet and several libraries for its ASP.Net language. And by the end of the year the company announced sponsorship of projects to port both the Node.js development platform and the big data analytics tool Apache Hadoop to Windows. It’s even making Linux available on Azure, the company’s cloud computing platform. And now it has open sourced Entity Framework, a framework that helps developers simplify data manipulation. Entity is now part of Microsoft Open Technologies, a subsidiary launched earlier this year to house open source projects. You can find the source code for Entity on Codeplex, Microsoft’s answer toGitHub. It’s another step in the right direction, but it’s nothing earth shattering. Microsoft is continuing to put its open source efforts into low risk developer tooling projects. Although representatives Microsoft’s partners in porting Node.js and Hadoop (Joyent and HortonWorks, respectively) have spoken highly of Redmond’s involvement in those projects, I’m not sure how community involvement the other projects have garnered. I’d still like to see Microsoft open source something bigger, something more core to the company’s business. As an increasing number of mobile applications trend toward web services for making the applications appear “live”, it is important that the requests that the application makes consider adequate security procedures. Let’s understand some of the things that a Windows Phone developer should consider when designing a Windows Phone application. The Windows Phone 7 platform is based on Silverlight 3. However, the Silverlight platform for Windows Phone 7 only supports basic authentication. This means that Silverlight 4 networking features such as NTLM authentication,UDP multicast client, and WCF RIA services are not supported for Windows Phone 7. Previously called ADO.NET data services, Windows Phone 7 operating system does not support WCF data services. Windows Phone 7 platform does not support complete JSON serialization. However, partial serialization support is available through the DataContractJsonSerializer class. Sockets and custom bindings are not supported in Windows Phone 7 operating system. Since Windows Phone 7 operating system only supports basic authentication, it makes the scenario of HTTPS calls more interesting. To exercise the HTTPS scenario, you need to have an HTTP connection over a Secure Sockets Layer (SSL) or Transport Later Security (TLS)connection. You achieve this by specifying a URL starting with https://, and Windows Phone platform takes care of the underlying wiring. When you make a call to an https://” endpoint, Windows Phone checks the certificate returned by the web service and verifies that the certificate is from a trusted authority. Once this is verified, further communication takes place in an encrypted environment. Windows Phone lets you install trusted certificates on the device. However the Windows Phone platform does not expose the certificate values to applications running on the device. This limits the application from implementing mutual authentication scenarios. Safe programming practices dictate that it is most secure to prompt the user for credentials when the scenario demands one. However, applications today in the name of usability allow storing for credentials on the device itself so that applications can use them without prompting a user. When storing credentials on a phone, please be sure to apply appropriate encryption. In this article, we learned a few important things every application developer should know about security using web services in their Windows Phone application. Developing applications for Apple’s iOS devices including the iPhone, iPod Touch and iPad has, for the most part, meant using the Objective C language. For C# developers, this is a big turn off. Moving from C# to Objective C is something like going from Visual Basic to GW Basic. The languages are similar but different. Novell’s Monotouch brings the power and elegance of C# to the table, making it possible for Microsoft developers to code in a language they’re comfortable with. You’ll find the process even easier if you like to build forms in code rather than using a drag-and-drop designer like Microsoft Visual Studio. Monotouch provides bindings for all the form elements in the CocoaTouch class library. Admittedly, they are different from your typical Windows Forms app, but there are similarities just the same. All the standard elements like buttons and text boxes are there along with a whole host of new elements specifically designed for the touch environment on small screens. The first thing you need to know right off the bat is that you’ll need an Intel-based Mac if you want to actually test or debug your code. Monotouch uses the Apple SDK for a multitude of things including the device emulator, Interface Builder and, ultimately, the final executable code as it is linked to the base Apple libraries. To get the Apple SDK and their Xcode tool you’ll have to register with Apple’s developer program. If you want to actually deploy an app, you’ll have to pay the $99 annual fee. Novell offers a trial version of Monotouch that does everything you need except deploy onto a physical device. You can write all the code you want as long as you use the device emulator for testing. Be sure you follow the installation guide as the order of installation is important. Monotouch relies on the latest Mono runtime for OSX that must be installed first. There’s also a special version of Monodevelop with additional tools for Monotouch. If you’re comfortable with using Microsoft Visual Studio, you’ll feel right at home with Monodevelop. There are a multitude of resources to help you get up to speed quickly with developing using Monotouch. The tutorials web page has links to how-to articles, sample code and screen casts. If you learn better from a book there’s an excellent recently-released book titled iPhone Programming with MonoTouch and .NET/C# by Wally McClure, Martin Bowling, Craig Dunn, Chris Hardy and Rory Blyth. Both Wally McClure and Craig Dunn have active blogs with lots of good information as well. If you decide to try out code samples from either the book or from the Monotouch site, you’ll need to know a few things. First and foremost is the SDK version number. Many sample apps were built with earlier versions of the SDK and will have that set in the project options. If you compile an app and you don’t have the target SDK installed, you’ll get an error. To change the target SDK, simply open application options under the Project menu and change SDK version under the iPhone Build entry as shown below. One of the things you should do before you get too far along in coding is read Apple’s user interface (UI) document. If you have any plans of actually publishing and selling an application, it will need to comply with their guidelines or you’ll never get it approved for the Apple store. You’ll want to pay close attention to the screen rotation requirement. All apps must support screen rotation, so you’ll need to know how to adjust your screen elements when that happens. Coding for the iPhone family frequently utilizes the Model-View-Controller (MVC) design pattern. You can see it in many of the class names and supporting code. Apple’s iOS development introductory tutorial builds a basic “Hello World” app for the iPhone and uses MVC as a part of the design. Understanding these patterns and how they apply to different programming tasks will help you build better applications. The Cocoa Fundamentals Guide is a good read to help get you oriented to the Apple way of user interface design, and it includes a chapter on design patterns. This code will cause all the elements in the UIViewController to reorient when the operating system rotates the screen. It doesn’t do anything other than change things like text labels and buttons so that they render properly based on how the user is holding the device. You’ll have to write more code if you want to do something like add a navigation pane on the left hand side of the screen when the device is in landscape orientation. Building apps with Monotouch should look and feel a lot like Microsoft Visual Studio. You’ll have to adjust your thinking somewhat to the Apple way of doing things, but the transition isn’t that difficult. The demo version of Monotouch lets you get your feet wet without spending a lot of cash. You will have to buy the full version ($399 for the Professional Edition) when you get ready to actually deploy to the device. When it comes to the enterprise, Microsoft hit the ball out of the park in 2010. Here’s our favorite offerings. It’s been a successful year for Microsoft. The company took a lot of heat, but overall accomplished quite a bit — especially for its enterprise customers. Here’s our top tips for what Redmond got right in the past year. BTW: Because we’re an IT publication, we focused on Microsoft’s enterprise offerings, and left off those from its entertainment/gaming division (Go Kinect! ), with allowances for Windows Phone 7 because of its enterprise applications. Be sure to post your favorite 2010 Microsoft product — both for IT and consumer — in our comments section! Oft-neglected Mac users finally have an improved version of Office. Most notable is the inclusion of an Outlook client for the Mac. Microsoft completed its integration with Yahoo! (replacing the Yahoo! search engine with Bing) in the United States and Canada in August. It also integrated the ad platform so advertisers have one platform to work with. Bing continues to gain share, but it’s still overshadowed by Google. Microsoft released two beta versions of this cloud-based systems-management tool. When it becomes available next year, Windows Intune will allow midsize IT departments to manage updates, centralize malware protection, perform proactive monitoring and track inventory, among other things. Perhaps best of all, the $11 per PC per month subscription includes Windows 7 Enterprise upgrade rights and the option to purchase the Microsoft Desktop Optimization Pack for an additional $1 per PC per month. As an added bonus, Microsoft released a free version of Microsoft Security Essentials for small businesses. Launched in April, Microsoft’s popular IDE got a major facelift with substantial visual editing improvements, a new code editor, extended language support and parallel programming capabilities. It’s also optimized for SharePoint and cloud development. Microsoft released its successor to Office Communications Server 2007, Lync Server 2010, providing what it promises is the first viable alternative to PBXes. Microsoft intends to be a major player in the office telecom market. Not only did Microsoft ship SQL Server 2008 R2 this year, but it has started shipping SQL Server 2008 R2 Parallel Data Warehouse Edition (code-named “Madison”) based on the massive parallel processing product that Microsoft acquired nearly two years ago from DATAllegro Inc. The solution appears on hardware in mid-December as part of the new HP Enterprise Data Warehouse Appliance. Microsoft last month released the community technology preview (CTP) of the next version of SQL Server, code-named “Denali,” which it says will up the bar on scalability and availability. support for enterprise search, centralized administration, digital asset management and business connectivity services. Microsoft showed it’s not going to go back to its days of complacency in the browser market with the recent release of the Internet Explorer 9 beta. Among other things, Internet Explorer 9 emphasizes HTML5 support. In 2010 Microsoft announced, lined up partners for and delivered its successor to Windows Mobile with a brand-new and unique UI. Whether it’s able to put a dent into the momentum of Droids and iPhones remains to be seen, but Microsoft appears to be back in the game. Microsoft went “all-in” in the cloud this year. The company released its Windows Azure and SQL Azure cloud Platform as a Service (PaaS) in February and in October announced a roadmap that promises to flesh out the offering in the coming year in support of hybrid cloud services. Microsoft also announced numerous big wins for its Business Productivity Online Suite, which the company is re-branding as Office 365. Moreover, Microsoft announced the Windows Azure Platform Appliance, which will let large enterprises and partners run Windows Azure on-premises. Wondering why Microsoft Office 2010 isn’t on this list? Thought we left Office 2010 off the 10 Best Things Microsoft Did This Year list? No, we thought it deserved its own section, as it was perhaps the most important new product from Microsoft in 2010. Here are our 10 favorite features in the new suite. The Ribbon: The Ribbon is about as divisive as a speech by Newt Gingrich or Keith Olbermann. Many find it more intuitive, while just as many are confused. Like it or hate it, it’s a centerpiece of the entire suite. Locking the Office Doors: Office is a big target for hackers. One new piece of protection is Data Execution Prevention, which keeps rogue EXEs from running in memory space reserved for data. Backstage: Backstage shows up when you click the file tab. Instead of a simple list of functions, Backstage has a center panel that shows up when you click a task, and it presents options related to that task. Most Excel-lent: Excel 2010 has two main new features: PivotTables, which can be enhanced through Slicers (which offer better filtering of the data), and Sparklines, which can take a single cell and create a mini-popup chart that demonstrates patterns. A Brighter Outlook: Outlook is more and more the master of your communications. Now, it not only manages alternative e-mail back-ends such as Gmail and Hotmail, but it even ties directly to social networks. Office Web Apps: Office 2010 includes scaled-down Web versions of core apps such as OneNote, PowerPoint, Word and Excel. With Office Web Apps, you can work entirely online with a Web browser – even storing files on Windows Live. Get the Picture: PowerPoint and Word feature picture editors that used to be the domain of dedicated programs; the new editors can even adjust saturation and color temperature. Making a Powerful Point: Similar to how Word and PowerPoint can edit pictures, you can now edit video from within PowerPoint 2010. Found in Translation: Word includes a built-in language translator, perfect for an international company or your kid’s homework. The ValidateInputAttribute has received a nice little tweak in MVC 3 offering more fine grained control over parameters of a request. If we wanted to allow markup to go through we can add the [ValidateInput(false)] attribute to the action. The only problem with that is if we only wanted to allow markup in the Body and not the Subject we would have to write our own tests in the controller to prevent this. Not the most ideal or clean solution. MVC 3 solves this quite simply by extending the ValidateInputAttribute and allowing use to specify exclusions. This means we can have validation turned on but specifically state the we don’t want to validate a specific request parameter(s) (e.g. Body). A very minor tweak that makes a big leap to being able to produce cleaner more readable code. This gives you a window with a treeview format, as shown below, with nodes that you can expand ad infinitum (or until your machine runs out of memory). You also can right-click on the method names and go to their definition, or you can reset those methods as the root of the Call Hierarchy window if you want to work your way from there and don’t care about other methods anymore Further, you can view call hierarchies from the object browser too, so you needn’t always be viewing the code. This is a helpful visual cue for very complicated projects that we’ve all worked on at some point or another. A nifty little feature that Microsoft has added is the Quick Search window. This isn’t the same as the Search or Search and Replace window that searches for specific textual strings. It’s different in the sense that it searches across symbols (methods, properties, and class names) across your solution and filters them in the result view for you. In this example, I typed in ‘but’ and it brought back all symbols that contained ‘but’ regardless of position. You can specify multiple words to search for by separating them with a space. Although VS 2008 supports targeting different frameworks from the same IDE, one problem was that the Toolbox and Intellisense displayed types that were available to the .NET 3.5 Framework whether or not you were working with a .NET 3.5 project. This may have caused problems when you tried to use something, only to realize that it wasn’t actually available to you. VS 2010 gets smarter by only displaying items that you can use in the Toolbox and Intellisense (and other relevant areas). Further, if you change your project to use a framework version that isn’t available on your machine, you will be prompted and can choose to retarget to another version or download the target framework that you wanted. Don’t let the name intimidate you. I think Microsoft has done a great job of allowing you to take advantage of multi-processor systems with very easy syntax to enable parallel programming that you can quickly adapt to. In addition, to make things easier, VS 2010 comes with a set of visual tools that will help you debug and view simultaneously running threads. This means that you can view the task instances and the call stacks for each task in parallel. If you’ve been using the Parallel Extensions to the .NET Framework, then most of this will be familiar to you. A Task.StartNew will kick off your threads for you. If you then hit a breakpoint and view the VS 2010 Threads window, you can view the state of each thread and where it is currently. This can be seen below—the green indicating the main thread and the yellow indicating all the worker threads spawned. Parallel Programming itself becomes a feature of the .NET Framework 4.0 as opposed to it being an extension right now. With Parallel Programming, you get Parallel LINQ (PLINQ) and syntax to make parallelization of algorithms easier. In fact, it’s unbelievably easy. You should be able to see the real effects of these changes on multi-core machines under intensive circumstances. Of course, there is much more than I’ve gotten into here, such as parallel profiling views, but that’s beyond the scope here. You could get started now, if you’d like, by downloading the Parallel FX CTP. Everyone hates XSLT. If you don’t hate XSLT, you haven’t used it enough. Part of this attitude towards XSLT stems from the difficulty you face when debugging it—it is a huge unknown and can blow up in your faces when you least expect it. Visual Studio 2010 will offer an XSLT profiler to help with writing XSLT in the context of profiling and optimization. After writing your XSLT, you can use the “Profile XSLT” option in Visual Studio to supply it with a sample XML file that gets used for the analysis. Clicking on the ‘offending’ functions then takes you to the function details, among other views on the analysis available to you. Available to you are the paths of execution taken, assembly-level view of the execution, call hierarchy, statistics by function, and function details. No, your eyes aren’t deceiving you. You can set breakpoints, have locals set, and step through the template functions as you please. This should help alleviate your collective fears of XSLT immensely. While I’m on the subject of XML, VS 2010 also introduces a new XSD Designer. You would need to expose the ClientIDMode property so that the parent page can set it. That’s all you need to do, and the control gets rendered to the page with an ID of Label1. When it comes to databound controls, though, you’d have to do things a little differently; it’s really not acceptable to have more than one control with the same ID on a page. For this purpose, the ClientIDMode can be set to predictable and you also can specify a suffix that ensures that the IDs generated are predictable (but not fixed). And any controls rendered in the gridview should have IDs like “GridView1_PizzaLabelTest_1”. Note that you don’t need to specify the collection type because it is implicitly understood. In .NET 3.5, this would not have compiled because it would have understood ‘breakfast’ as type ‘Object’ instead of Crumpets. .NET 4.0 understands Crumpets, a statement I never thought I’d actually write down. C# has had this for a long time—long lines of code can be split across several lines for more readability. VB.NET has had it, but you’ve always had to add an underscore (_) at the end of each line, which could get a little annoying. Certain types of statements can now be split across several lines without the _ required. In VB.NET 9 (.NET Framework 3.5), Lambda Expressions always needed to return a value regardless of whether it was required or not. This could often cause confusion when switching between C# and VB.NET. The .NET Framework 4.0 addresses this issue by allowing VB.NET to create Lambda Expressions that don’t return anything. And, Lambda Expressions can now also contain statements instead of having to pass the logic to other methods as you had to do previously. At runtime, GetOneOfThem() evaluates to either Juice() or Coffee() and then the corresponding method is called based on what the compiler resolves 'drink' to be. The above is a very simple example of dynamic programming—there is more to this. The underlying implementation of dynamic programming is the DLR—the Dynamic Language Runtime—which is what allows you to invoke things in a dynamic fashion. You can read more about dynamic programming and other new features in C#. You can have a look at VS 2010 yourself if you'd like and if you can meet the hefty requirements for the Virtual PC image. You will need about 70 to 80 GB of hard disk space available, 2GB of RAM and a dual-core system at the least. The download is here. Don't forget to have a read through the C# Future documentation as well for more information on the DLR. Finally, you can also participate in the feedback process by submitting any bugs you find to the Microsoft Connect program for VS 2010. You are currently browsing the Microsoft category at Naik Vinay.